Children below twelve years of age pay a lower rate, please indicate how many children in your group when making your reservation. Our tour includes entrance fees to sites, drinks and other refreshments. There will be a cooler filled with refreshments for enjoyment of guests throughout the duration of the tour. Our refreshment list includes Spring bottled water, and Sodas. Our Capital Tour is an important part of the Full Day Saint Lucia Tour. Get a chance to see the Cathedral Basilica of the Immaculate Conception at Micoud Street in Castries St. Lucia. Get an introduction to the history and people of the city. Visit the heart of the city and witness local architecture, sites and other landmarks. Witness local Saint Lucian culture through our local art and craft. 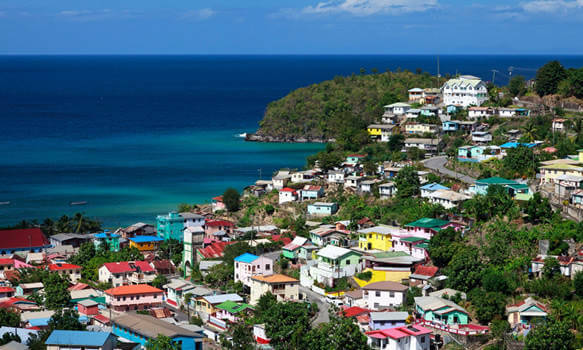 Take some priceless photos as you tour one of the Caribbean’s best cities, Castries in the Helen of the West Indies in Saint Lucia. 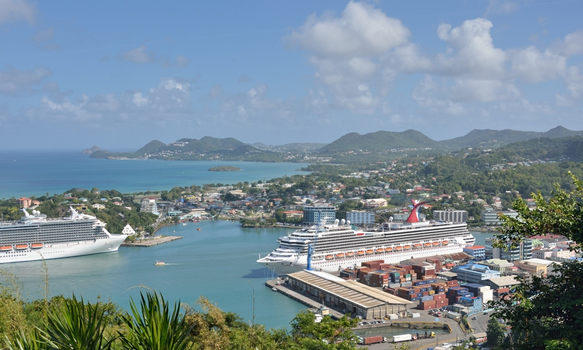 Morne Fortune is a historical point overlooking the city of Castries (including the harbour and cruise ships at port) with views stretching all the way to the northern point of Saint Lucia. With priceless views and a cool comfortable climate, The Morne is an ideal stop along your tour through Saint Lucia. Home of Government House, Sir Arthur Lewis Community College and more you are bound to enjoy your time at the Morne. Government House is the official residence of the Governor General of Saint Lucia, our local Head of State. 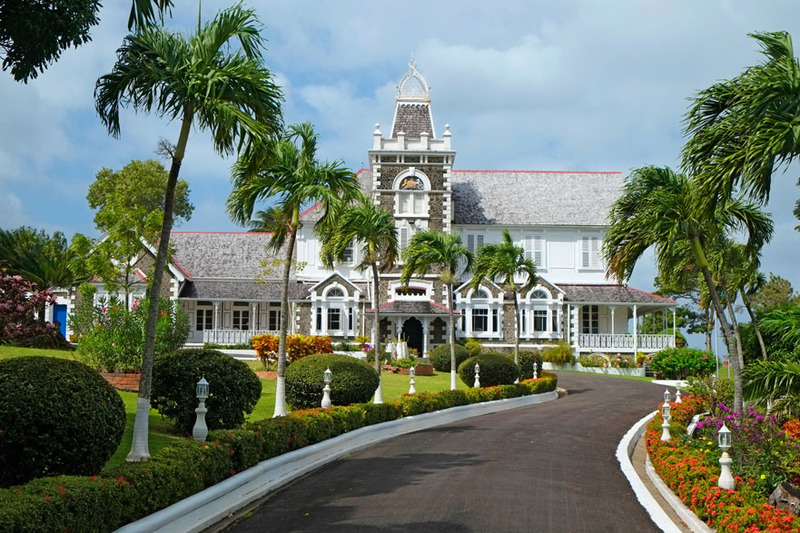 Government house is a noteworthy work of historical architecture in Saint Lucia. An old-Victorian styled structure, this building has been preserved throughout the history of the island since it was first built in 1865. 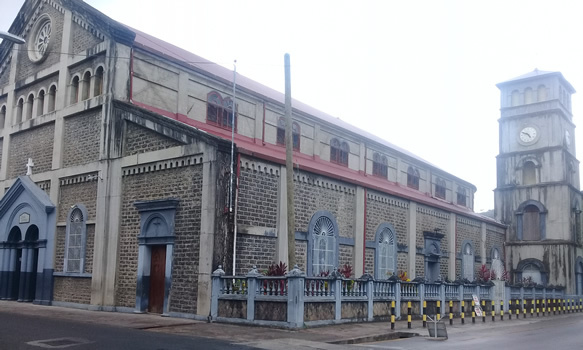 Aside from its obvious outstanding features, this building is home to some very important documents, artefacts and other items of significant historical significance. 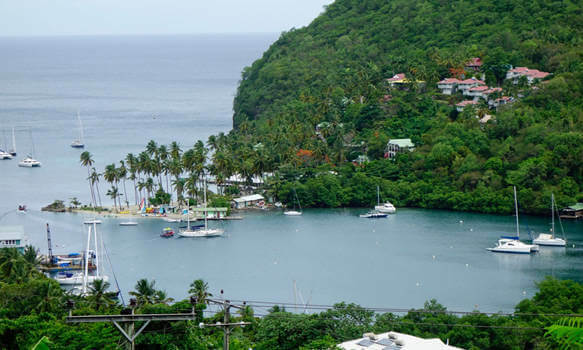 Marigot Bay is located on the western coast of the island of Saint Lucia 4 miles southwest from the capital and a short distance from the Saint Lucian National Marine Reserve. 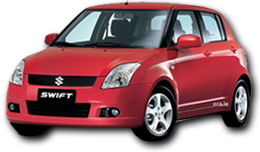 It is surrounded on three sides by steep, forested hills. The American novelist James A. Michener famously described Marigot Bay as "The most beautiful bay in the Caribbean. After Marigot Bay, the road runs through the Roseau banana plantation and lush green vegetation. 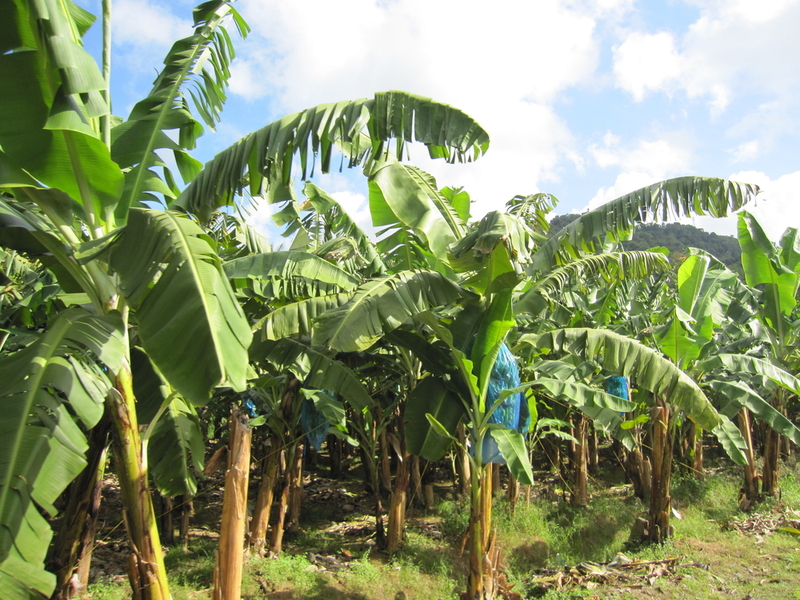 Banana is St. Lucia’s main export crop. The plant is propagated by roots or from suckers and takes one year to reach maturity. Each planting area consists of one bearing plant. When the crop is bearing, bunch sleeving is carried out. Each bunch is covered with a polythene bag for protection. Banana is use to make banana flour, baby food, banana chip, banana ketchup. Banana bread, and banana porridge. Learn about the banana plantation's history and also about the harvesting process. You will get a chance to sample St. Lucia's local bananas. The banana plants are smaller in size but produce fruits that are sweeter than your usual bananas. Our bananas are as sweet as they come for your eating pleasure. The Coastal Communities of Anse La Raye and Canaries on the west coast of Saint Lucia are fishing villages, full of life and colour. The traditional Saint Lucian lifestyle is preserved while maintaining observance of the modern necessities. The waterfont of Anse La Raye is home of the fishermen, however you can view or purchase locally made craft and souvenirs. Anse La Raye which is translated into English as the Bay of the Sting Ray has become popular for the Anse-La-Raye Fish Fry a weekly fish festival held every Friday evenning. Canaries (or Kanawe in Creole) is located on the West Coast of Saint Lucia. 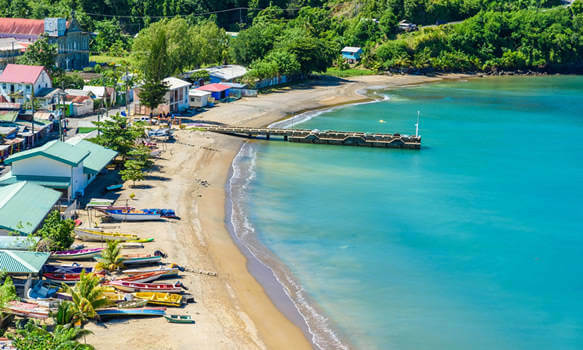 It is a small fishing village and it is nestled along the West Coast road, between Anse La Raye and Soufriere, and there are scenic views from both the Northern and Southern approaches. Until the 1960s there was no road transport to the village and it was only accessible by boat. Since the construction of the West Coast Road it is a stop on the road between Castries and Soufriere. When the price of sugar dropped in the middle of the 20th Century, the estate closed and many people left for England to look for work. Many sent money back to their families and since then many local businesses have appeared. An important national landmark, The Pitons were revered and recognized worldwide even before being officially recognized as a UNESCO world heritage site. A Saint Lucian symbol and treasure best viewed from Soufriere, the Pitons are an important photo stop on the Full Day Tour of Saint Lucia. Inspired the name of Piton Beer, Piton Farms Spring Water and many other important local products and companies. The Pitons rise out of the sea at 2619 feet (Gros Piton) and 2461 feet (Petit Piton showing off their majestic beauty to all who would witness. 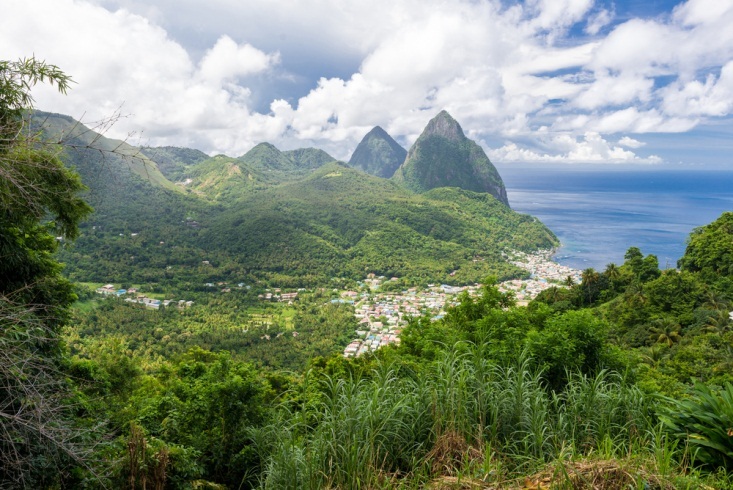 The town of Soufriere on the West Coast of Saint Lucia is a popular place for tourists to hideaway or blend in to live like a local. 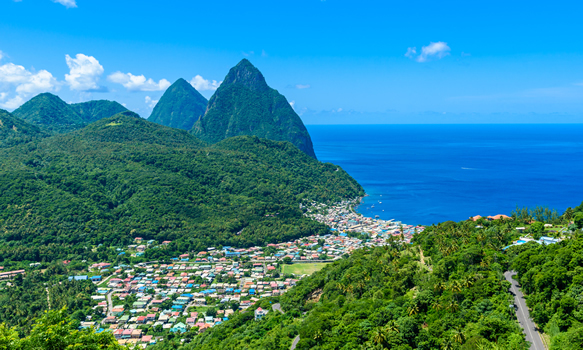 Soufriere is the second largest town in Saint Lucia and was the island’s first capital. 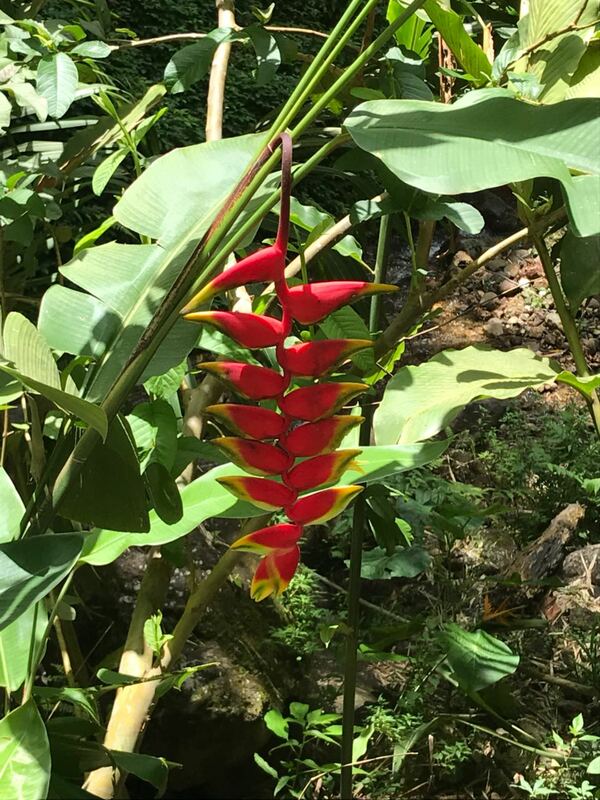 Full of life and colour, the smells and tastes available in Soufriere are rich and give a unique experience that would be difficult to put into words. As Saint Lucia’s premier town for Sightseeing, you will witness waterfalls, rivers, botanical gardens, historical buildings and sights. A natural beauty, you shouldn’t visit Saint Lucia without visiting Soufriere. 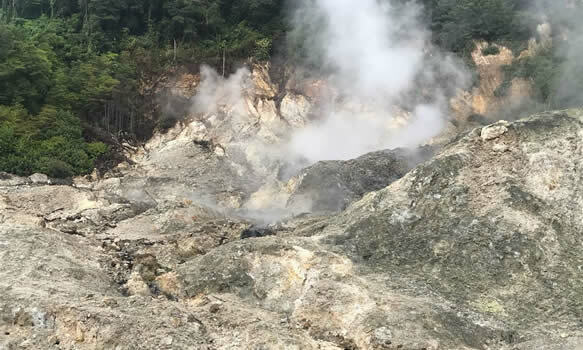 Visit the Sulphur Springs Saint Lucia's Drive in Volcano. Although now dormant, you cannot help but to enjoy the Sulphur Springs. The crater is approximately 7acres wide and there is a path and road to the elevate path where the entire crater is visible to you. Awaken your senses at this checkpoint of your tour, make memories as you tour the Caribbean’s only drive in volcano. 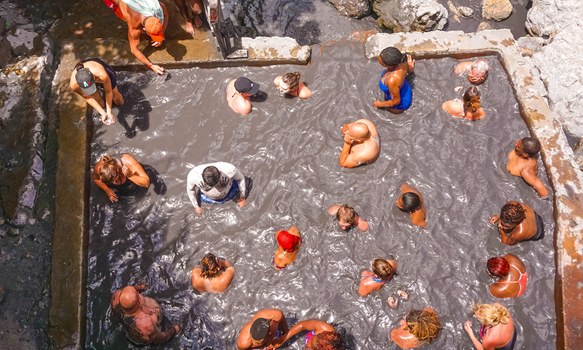 Possibly the highlight of your tour, the mud bath at Sulphur Springs will rejuvenate your body. The black water pool with its 38.7oc (101.6 Fahrenheit) waters is the perfect place for a bath. The mineral rich mud at the Sulphur Springs is said to make skin more youthful and renew the body. The open air natural pool is a unique experience that has 100% approval rate from visitors to the Sulphur Springs. Safe for a bath and dip but not for diving, there are seats and ledges for safety and comfort. The 50ft waterfall drops down into a freshwater pool. There is a short nature trail heading from the parking area to the waterfall area. The beauty of the Toraille Waterfall is enhanced by the beautiful flowers and plants, the singing birds and serenity of crystal clear water. 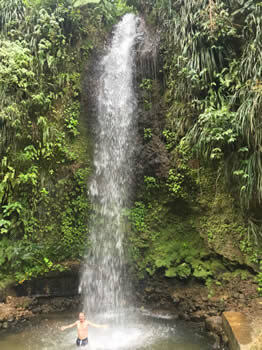 Located a short drive from the main street of Soufriere town, the Toraille waterfall is a great stop along the Cost Less Tours Full Day Tour. 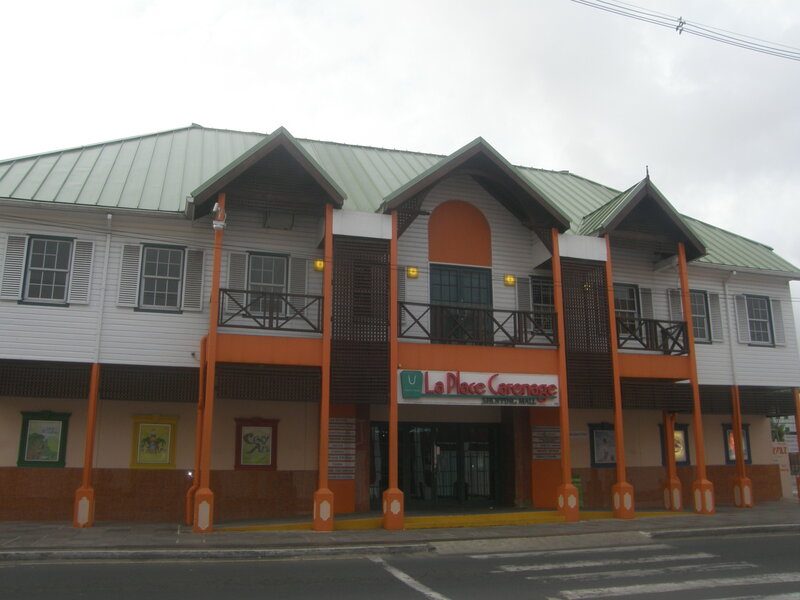 La Place Carenage and Pointe Searphine located at The Waterfront, Castries is a duty free shopping complex. This stop is a good opportunity to catch up on shopping in the city. With over thirty shops including gift shops, arts and crafts and liquor there are enough options to make your shopping easy and hassle free. 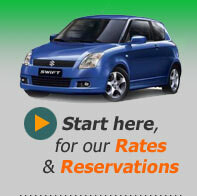 As your last stop, we would then take you back to your cruise ship or hotel.